More than 100 staff were evacuated from a family court in Bristol after a fathers' campaign group protested outside the building. The employees were told to leave when a fire alarm was set off in the court. Fathers 4 Justice campaigners wearing superhero outfits were stopped at the courts during a street demonstration. The 30-strong demonstration was joined by two men who scaled the roof of deputy Labour leader Harriet Harman's home in south London. Campaigner Jolly Stanesby said the group wanted parental equality. A Bristol County Court spokesperson said court proceedings were disrupted for about 30 minutes. "Court business has now resumed as normal. No-one was injured in the incident." 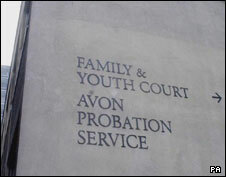 Police and fire services were called to the scene after a fire alarm was set off in a family court. Court staff could not confirm who was responsible for the activated fire alarm. An Avon Fire and Rescue spokesman said the call was a false alarm.